This slot game, brought to you by the legends over at Novomatic, brings together the dark side and the light side. It’s not about Star Wars, though, it’s all about horses – wild horses! This slot game will be loved by equestrian fans and anyone else who enjoys playing other Novomatic slot games like Book of Ra Deluxe, Dolphin’s Pearl Deluxe and Lucky Lady’s Charm Deluxe. In this horsey slot game, nature and magic collide to create something unusual, visually stunning, entertaining and profitable! Aside from all of the normal symbols which you can match to get payouts, there are plenty of Wilds and Scatters to help you on your way to getting free spins and big wins! Watch out, however, as the free spins in this game can end up going totally crazy on you – just like a wild horse! Don’t let these wild horses canter past you! 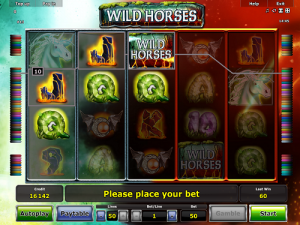 Load up Wild Horses slot game and enjoy experiencing the wild rush of getting a big win. Once you get going, wild horses won’t be able to drag you away! As is common in many online slot games, there are lower-paying symbols and higher-paying ones and the lower-paying symbols are card values. The card value symbols in Wild Horses range from 9 through to the Ace and each of them look as though they’re made from stones arranged in a pile to make the letter or number. The higher-paying symbols are light and dark. The light jewel symbol looks like a silver brooch with a blue gem in the middle and the dark jewel symbol is also a brooch but with a red gem in the centre. Above these on the paytable are the light and dark wild horses themselves. The light horse is a serene white unicorn and the dark horse is a beautiful black beauty! In order to get yourself a payout, you’ll need to spin at least three matching symbols on one of Wild Horses’ 50 paylines and the identical symbols will need to fall on neighbouring reels, starting from the leftmost reel. Open the paytable to see exact amounts for each combination of symbols, according to your bet. You can alter your bet by increasing or decreasing the number of lines you wish to bet on as well as the amount you want to bet on each line. If you want to bet on all 50 lines, the minimum bet per spin is 15.00 as the minimum bet per line is 0.30. On top of these normal symbols, there’s also a Wild and a Scatter. The Wild symbol reads ‘Wild Horses’ and this symbol is fantastic as it can substitute for any other symbol on the reels, except the Scatter symbol. The Scatter symbol is both the dark and light horses merged together into a swirl and whenever you spin three or more of the Scatter symbol, you’ll trigger free games! Before the free games start, you’ll need to choose a side: the light side or the dark side. Depending on which side you choose, the reels will lighten or darken in colour and then the free spins will begin. During the free spins every time you spin a light or a dark wild horse symbol it will be counted at the top of the screen. If you chose the dark side and more dark horses than white horses land on the reels, or they’ve landed in equal numbers, you’ll trigger another set of free spins and vice versa, otherwise you’ll head back to the normal game. If you keep choosing the right side at this Novomatic casino game, you’ll keep getting more free spins and we’re telling you, they can go absolutely wild! As this game is a Novomatic classic, it’s not too unusual that Wild Horses has a gamble feature and an autoplay feature, both of which are signature Novomatic ones. The autoplay feature can be switched on and off whenever you like, but note that you won’t be able to alter your bet or gamble your wins while it’s on. The gamble feature in Wild Horses is a 50/50 chance, double-or-nothing, gamble feature with cards. The aim of the feature is to choose the colour of the next card – get it right and you’ll double your win amount but get it wrong and you’ll forfeit it!